I left Pembury on a dry, cloudy but cold morning heading first for the nearby Hop farm at Beltring, for the first photo stop of the ride, then onward to Yalding Bridge for the next one. 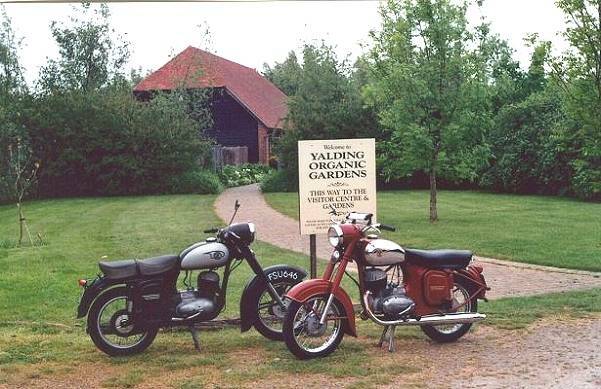 Arrived at Yalding Organic garden by 12.00 where I met up with Norman Kinnish on his CZ 455. We decided to drive onward through the country lanes of the Garden of England with both bikes running well in light traffic. We finally stopped at Sissinghurst Castle where attempts to acquire refreshments were not successful due the numbers of visitors, so we held a photo session in front of the castle as the sun struggled to break through. Norman then needed to head south to the coast, and I needed to go west so we parted and I took a leisurely ride back through the villages of Goudhurst, Horsmonden and Brenchley, stopping at the Castle Hill viewpoint for a snack. Arrived back in Pembury after about a 3 hour ride having covered 46 miles. By Arthur Fleming - Pembury, Kent. As I wheeled my model 360 Jawa out of the garage for the International Jawa/CZ day, the air temperature was cooler than I would have liked and the sky overcast. However, by the time I was ready to leave for the rendezvous point, the sun had started to periodically break through the cloud. The run planned was up into the beautiful Cotswold area of England, visiting ‘quintessential postcard’ villages which so many tourists flock too during the warmer summer months. For non UK readers of this article the part of England it’s in, the Cotswold’s are to the west of Oxford, and east of Gloucester and Cheltenham. To the north is Stratford Upon Avon, famous for everything Shakespearean. As I rolled up to the meeting point John Kennedy was already there with his Jawa model 640 and Velorex 700 sidecar. We waited to see if others would come, but as no one else did, at just after 10am we set off. Our intention was to keep off the major traffic routes wherever possible and to keep to the minor and unclassified roads. We hoped this would give a leisurely ride through beautiful countryside without having to worry too much about other traffic, so, with John leading we set off. Our first port of call was to be the village of Fairford in Gloucestershire, so John led travelling through the small hamlets of Hannington and Kempsford. Fairford to most UK readers will also be known as the site of the large RAF base used by the USAF for their tanker fleet, and also where the huge International Air Tattoo is held most years. As we pass by it however, the only plane in sight was a fighter that was parked up, other wise the place seemed almost deserted. On arrival in the village of Fairford we headed for the watermill and weir where we parked up for a photo shoot next to the pond. From Fairford it was then onto Bibury, a very attractive village famous for its fish farm and the ‘listed’ Arlington Row cottages. Buy any post card of Bibury and these cottages are sure to be on it. Looking at them is almost like looking at a film set of the 16th –17th century. In fact I do believe film companies have used them in the past. Another short photo break here, and it was then off to the village of Northleach. Northleach’s prosperity in the past was build around the wool trade, but of course now it’s just another stop on the Cotswold tourist route. John told me that it was one of the old main ‘coaching’ routes from London to Cheltenham and Gloucester. We parked up in the main square and it was plain to see just how it had developed. It is at times like this that John’s sidecar seems to be like an Aladdin’s box, with everything you would ever want stored inside. This time John magically produced a thermos flask and we were both able to have a refreshing drink. While there, a car pulled up and said that the guy thought John was a parking attendant with his yellow and black jacket on, the occupants of the car also shouted out “They’re some nice bikes”. We had been noticed at last! From Northleach we took the main A429 road to Bourton-on-the Water. Now, this village is possibly the most visited of all by tourists and although picturesque and beautiful, does become extremely crowded. With it being so crowded it was not our intention to stay too long here, so on arrival I parked up and then got John to ride his bike to one of the small bridges that there are, so that I could take some pictures. With it being quite crowded this is not always as easy as it sounds, but I did manage to get a few pictures, and it was while I was taking the pictures that I was approached by one of the visitors who said. “It’s nice to see these bikes, as they are not as popular as others”. He spoke with an accent, and when I asked him where he came from, he said – Czechoslovakia, although now living in England. He certainly seemed pleased to see something that reminded him of home. The final leg of out outward-bound journey was to the Rugby Football Club at Stow-on-the Wold. The RFC were hosting a weekend rally by the Rudge Enthusiasts Club, and as one of my ex neighbours owns several Rudge Motorcycles, he had invited us to visit. The other reason for visiting was to look at the site in general to see if it would be suitable for the UK Jawa/CZ club to use as a National Rally venue in the future. 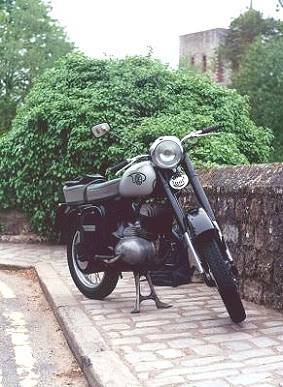 On arriving at the site, there were already many Rudge motorcycle on site, although it was plain to see that the majority had actually been trailered there. I suppose due to the age of many that wasn’t really surprising, but it was nice to know that most of our rallies actually have the bikes ridden to them. John and I wandered around the site and I have to say the field was nice and flat, although the clubhouse was a few hundred yards away. We visited the clubhouse and looked around, and it would certainly suit our requirements, although at the time of our visit, food was not available. 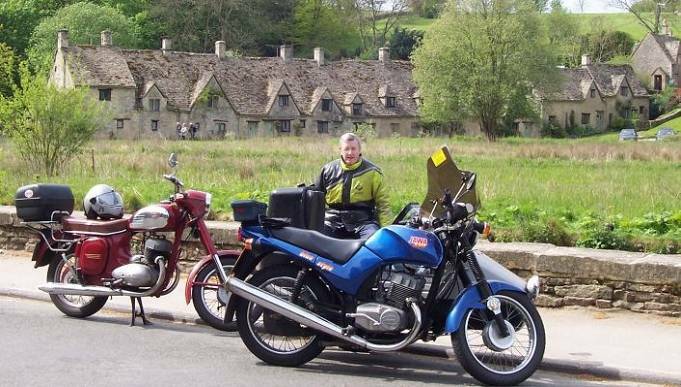 On our return Martin Broomfield from Timsbury near the city of Bath had turned up on his very nice Jawa model 638. So at least there were now three Jawa’s to be seen. A few of the Rudge guys came over and looked at the bikes, but generally they seemed to keep very much to themselves. As a club they were well organized with a small marquee on site (complete with hot air heating). Apparently in the evening they were to have a group playing. We were asked if we would like to accompany them on a run that they were about to go out on, but we politely declined, being on our own run. It was then time to start heading back. Martin indicated that he would like to go and visit the small motor museum at Bourton-on-the water, so with John once again leading we were off down the small narrow lanes heading in Bourton’s general direction. When close by, Martin peeled off; we waved our goodbyes and continued south traveling through the villages of Great and Little Barrington. It was then on towards the village of Filkins before turning off onto the main A360 which took us back to Lechlade. Lechlade is the furthest navigatable point boats can travel on the river Thames, and it is also a popular visiting place. We had just crossed over the river on the old Toll Bridge (Half-penny bridge), when I looked across to see there were many narrow boats moored up, with loads of people walking along the towpath. John and I just continued on to his home in the village of Highworth, which is only about 4, or 5 miles further south, where his wife kindly gave me some refreshments, before I continued my journey home. From leaving home to returning the old Jawa had traveled 77 miles without the slightest hic-cup or problem. The run had been very enjoyable, in excellent company, and the bikes had received some positive attention. Without doubt, the best way to promote the Marque and the various worldwide clubs is for the public to see these great bikes being ridden. Our small ride was just one of many being done on the same day. By Ian Bridge – Swindon, Wiltshire. 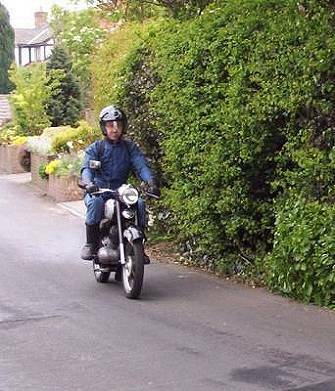 Jawaday dawned cool and cloudy, I stepped into the garage to wipe a cloth over my 1969 CZ 455, 250 cc single before setting off from my home in Eastbourne, East Sussex, England to meet Arthur Fleming at Yalding Organic Gardens in Kent, 40 miles away. As soon as I set off it started to rain. Stopped at a local filling station to pull o my leggings. at this point I must confess that I did ponder on the wisdom of heading off into rain, but decided to give it a go. The rain petered out after 10 miles and I had a pleasant ride through the 'Garden of England' before arriving at 12.05 and meeting up with Arthur who was on his 1962 CZ 450. We rode together to Sissinghurst Castle about 15 miles away where we got permission to photograph the bikes in front of the Elizabethan entrance. Photos will follow. We said our goodbyes and set off home. The ride home was pleasant passing through Battle, the site of the Battle of Hastings (1066) before arriving home after completing about 100 trouble free miles. By Norman Kinnish – Eastbourne, Sussex. Photos show that on Jawaday there was a 100% turnout by the 'Achnaha Branch' in Scotland. One bike used was an MZ 125 as the CZ 350 wasn't operational in time, the other bike taken out was a 1974 634-04 which has just finished being cleaned up. We took a ride to Sanna Bay and these are now probably the westernmost bikes on the UK mainland, Sanna Bay is about 1.5 miles from home not only did we check the bikes out, take the photos and come home, Jawaday got two bikes out of mothballs and the riders too.